Johns Hopkins University Press, 9781421429441, 352pp. Mary Shelley, Emily Bront , George Eliot, Olive Schreiner and Virginia Woolf: they all wrote dazzling books that forever changed the way we see history. In Outsiders, award-winning biographer Lyndall Gordon shows how these five novelists shared more than talent. In a time when a woman's reputation was her security, each of these women lost hers. They were unconstrained by convention, writing against the grain of their contemporaries, prophetically imagining a different future. We have long known the individual greatness of each of these writers, but in linking their creativity to their lives as outcasts, Gordon throws new light on the genius they share. All five lost their mothers in childbirth or at a young age. With no female role model present, they learned from books--and sometimes from an enlightened mentor. Crucially, each had to imagine what a woman could be in order to invent a voice of her own. The passion in their own lives infused their fiction. Writing with passionate intelligence of her own, Gordon reveals that these renegade writers inspired a new breed of women who wished to change a world locked in war, violence, exploitation, and sexual abuse. Gordon's biographies have always shown the indelible connection between life and art: an intuitive, exciting and revealing approach that has been highly praised. 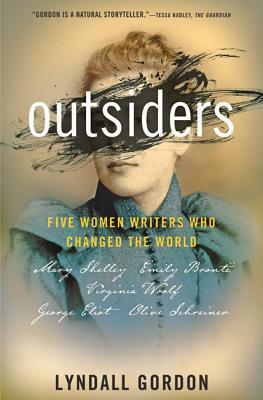 In Outsiders, she crafts nuanced portraits of Shelley, Bront , Eliot, Schreiner and Woolf, naming each of these writers as prodigy, visionary, 'outlaw, ' orator, and explorer, and shows how they came, they saw, and they left us changed. Today, following the tsunami of women's protest at widespread abuse, we do more than read them; we listen and live with their astonishing bravery and eloquence. Lyndall Gordon is the author of six biographies, including Lives Like Loaded Guns: Emily Dickinson and Her Family's Feuds and The Imperfect Life of T. S. Eliot, and two memoirs, Shared Lives: Growing up in 50s Cape Town and Divided Lives: Dreams of a Mother and Daughter. She is a fellow of the Royal Society of Literature and a fellow of St Hilda's College, Oxford.